Founded in 2001, InMotion hosting is an interesting company. It’s employee-owned and employee-operated, so there’s no heavy management level pulling the strings—for now at least. InMotion is based in Virginia and California and their support is outsourced exactly 0 percent. Yup, all help comes straight from the good old USA. But is everything really an American dream coming true? Let’s find out. Shared hosting is found under “Business” hosting. There are three packages and all include unlimited disk space, bandwidth and shared SSL Certificate. VPS hosting also has three packages. They all get unlimited domains and two IP addresses (although in the most expensive you get 3), but the rest vary. VPS-1000S: 60GB of disk space, 2TB of bandwidth and 4GB RAM. VPS-2000S: 130GB, 3TB of bandwidth and 6GB RAM. VPS-3000S: 200GB, 4TB of bandwidth and 8GB RAM. Reseller hosting continues in a similar manner with three packages. They all come with RAID 6, SSD Drives, and a dedicated IP Address. R-1000S: 80GB of disk space and 800GB of bandwidth. R-2000S: 120GB of disk space and 1200GB of bandwidth. R-3000S: 160GB of disk space and 1600GB of bandwidth. Dedicated hosting offers six packages. Essential: Intel Core I3-2120 2C/2T, 4GB RAM, 1TB 7.2K SATA3, and 6 TB data transfer. Advanced: Intel Xeon E3-1220 v2 3.1 GHz 4C/4T, 8GB RAM, a choice between 120GB SSD or 1TB 7.2K SATA3, and 10TB data transfer. Elite: Intel Xeon E3-1230 v2 3.3GHz 4C/8T, 16GB RAM, RAID-1 2x250GB SSD or RAID-1 2x2TB 7.2K SATA3, 10 TB data transfer and free 2TB SATA backup. The next three packages witch gears to higher speed are next three packages. All offer 15TB data transfer. Commercial Class 500: Intel Xeon CPU E5-2430 v2 2.5 GHz 6C/12T, 16GB RAM and RAID-1 2x250GB SSD. Commercial Class 1000: Intel Xeon CPU E5-2430 v2 2.5GHz 6C/12T, 32GB RAM and RAID-1 2x500GB SSD. Commercial Class 2000: Dual Intel Xeon CPU E5-2430 v2 2.5GHz 12C/24T, 64GB RAM, and RAID-6 4x500GB SSD. Around 10 minutes after registration, we still had received no email and the phone call we got was so muted that it was indecipherable. About minute after that, though, emails started to pour in, one containing the link for the confirmation. After a few minutes of holding our breath, we were ready to roll. The more website-related items are, of course, in the control panel, but there is quick access to some of the bare necessities right in the AMP. They’re hidden under the scroll-down menu in the My Account tab. You can access the control panel from the AMP or go directly to its page, because there is no automatic login to both of them. Security first. Oh, did we mention that you will get a free SSD? Now you know. The control panel is pretty standard and easy to work with. If you do run into problems, Inmotion has a series of tutorials on cPanel features.You can log in to the cPanel via the AMP or by logging in directly to the url. Settings, databases, emails, logs, etc. are at your disposal, but don’t expect anything fancy. Just like the cPanel, creating and using email is cut-and-dried. You will need to create a strong password, although InMotion standards may be a little lower than other hosts. The same password that ranked 90/100 here usually only ranked 60/100 with other hosting providers. InMotion offers the standard roster of webmail clients. It does, however, provide IMAP email, which enables you to access and sync your mail from multiple devices. Not all hosting services offer this. One of the registration perks with InMotion hosting is the ability to install WordPress, Prestashop or Joomla on your account. That way, you’ll be spared some time and a few clicks. There are other CMSs that you can install with Softaculos, or if you are more of a DIY person, you can upload your own files. If you already have a website, you will get a free transfer with any package. If you want to build it from scratch, you can install and use their customized website builder; you’ll find it under the AMP “Install Popular Software” section. The good thing is that it’s totally free, but the bad thing is that it needs a bit of updating in the design department. Websites created with it will be nice, but tend to look a bit dated, and you will need another login detail. There are few more options when it comes to blogs, but the greater number of choices are in the CMS area. There is also a nice roster when it comes to e-commerce solutions, but other than that, the choices limited. Don’t get us wrong, there are a decent number of scripts to choose from, but we’ve seen a bigger assortment with other hosts. We’re always pleasantly surprised when testing shows a host has 100-percent uptime. Sure, our tests weren’t conducted over a period of months, but InMotion tested better than most hosts tested in the same span of time. Although there was a spike in customer complaints about reliability a few years ago, complaints have dwindled since that time. Our website’s server was located near Wichita, Kansas, so we couldn’t test coast-to-coast response times. We did have some surprises. Ashburn, Virginia had an excellent response time, usually around 0.25 seconds. However, it also had the most random and intermittent spikes that would go up to 0.8 seconds, independent of number of users. On the other hand, Palo Alto had a stable response and no irregularities, but its response time was longer, around 0.9 seconds. The longest response time was from Singapore, which, at its worst was around 3.65 seconds. Surprisingly, InMotion had a relatively stable response globally. Tokyo was usually just below 2 seconds, Sao Paulo under 1.5 seconds and Dublin was usually slightly above 1 second. The reliability of servers was surprisingly good and stable with various numbers of users. That said, there were a few random exceptions with spikes that were still under 0.8 seconds on the West Coast. All kinds of help are available to you with InMotion, including chat, email, ticket, telephone, community and (video) tutorials. You can even create a Support Center profile, but we’re not sure if it does anything more than track your activity within the support system. Response by all modes was fairly fast and helpful, with the exception of chat.The response from staff seemed a bit slow at times. There was more silence than chatting, but they were responsive when they had an answer. However, everyone was polite, problems were resolved in a quick manner, transcripts were sent, not to mention that once we got staff response within seconds of logging in. To conclude, there is very little to complain about here. 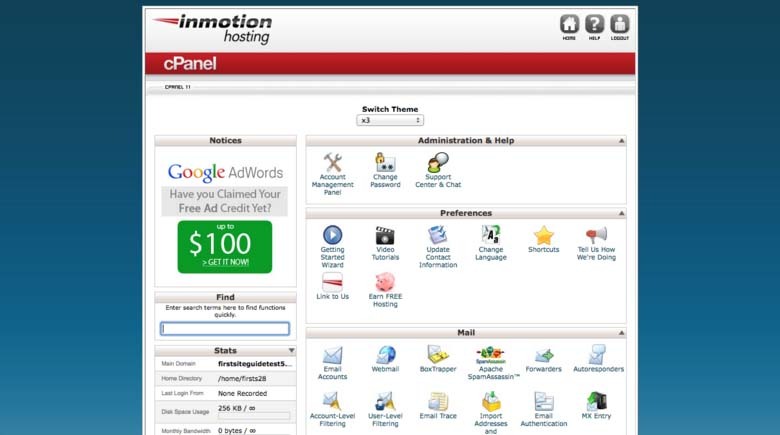 InMotion hosting is one of the best hosts to deal with when it comes to a money-back guarantee. Although some packages have a 30-day policy, most of them have 90-day policy, including the cheapest option we tested. There are many discounts that vary by the package and length of the contract. The longer the period of the contract, up to three years, the greater the discount. However, keep in mind that you’ll have to pay about 6 months in advance for certain packages. We tested one package that had a contract of 12 months, minimum. It’s not that there aren’t any options for one month, but the prices go up significantly. Only reseller packages are cheaper to rent on a month-to-month basis, rather than six or 12 months at a time. Don’t ask, we’re also scratching our heads. But to get down to actual prices of the concrete packages. Shared/Business hosting is the is the least-expensive option. Dedicated hosting While Essential, Advanced and Elite include a discount ($70 and up), the Commercial Class packages do not. There are many nice things to say about InMotion Hosting and very few bad ones. The only really serious drawback was the website builder. It’s dancing on the verge of becoming a “retro builder.” But with the option of installing other leading CMSs, this is not unforgivable. Finding a serious flaw was nearly mission impossible. Great help, excellent loading time, flawless uptime—it could only be better if they delivered hot cookies to your door when you register. There aren’t many cracks in the system, and those that are present are more a matter of aesthetics and learning to navigate their site. Having said that, InMotion may be more pricey in a long run than other hosts. But this level of excellence justifies the slightly higher cost. If you’re on a really tight budget, you may want to look at other options, but if you can swing it, we think you’ll be pleased with InMotion.